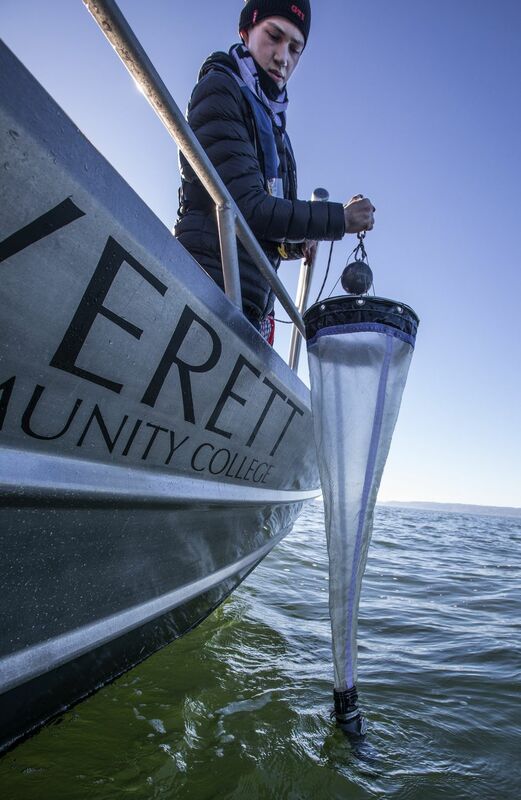 There’s no school in Washington quite like Everett’s Ocean Research College Academy, a Running Start high school organized around the study of marine biology that also gives college credit for every one of its classes. 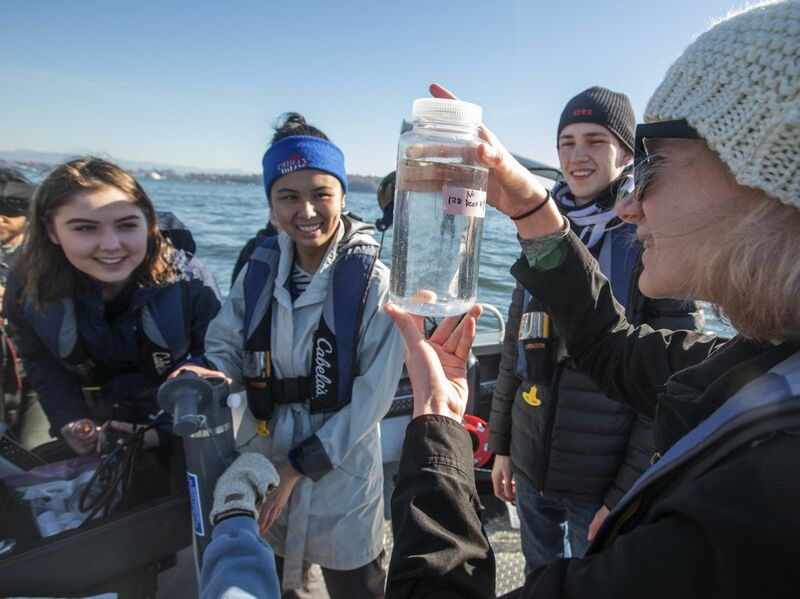 EVERETT — On the bow of the research vessel Phocoena one crisp afternoon this fall, nine high-school students hauled up a water sample from the depths of Possession Sound and marveled at the tiny, almost transparent, creatures wriggling in the salty water. 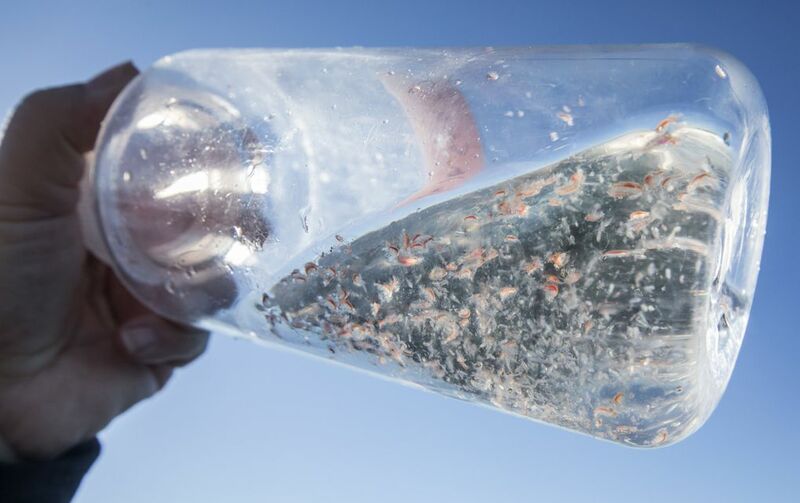 Using a zooplankton net, they’d captured the nearly-invisible bottom tier of the food chain: plankton, amphipods, krill, arrow worms and fish larvae, to name a few. Students at this public school — Ocean Research College Academy (ORCA) — have been measuring the health of Possession Sound every month for nearly two decades. The subject of marine ecology forms the overarching theme of nearly every lesson, even in classes on writing, math and history. ORCA admits incoming 11th-grade (and occasionally 12th-grade) students once a year; the deadline for the 2018-19 school year is May 1. Students must take a standardized test showing they are ready for college-level math and English, submit three essays and provide a letter of recommendation. There is no cost for up to 15 credits, but students must pay for books, lab fees, student fees, some field-trip fees and transportation. There will be an information session at 6 p.m. April 19 for the upcoming school year at ORCA, 1205 Craftsman Way, Suite 203, Everett. ORCA is not like any other school in Washington, or possibly the nation. As part of the state’s Running Start program, it offers high school and college credit for all its classes, for one. Teachers use hands-on activities tied to the marine environment to breathe life into lessons about writing and math as well as science. At a time education experts are searching for new ideas to reinvent the American high school, ORCA’s founder, Ardi Kveven, wishes somebody would steal the ORCA idea. In many ways, it captures a call for a more personalized, experiential atmosphere for students in their junior and senior years. But even in Western Washington, ORCA isn’t widely known. Kveven estimates only 10 percent of ORCA’s students are top students in their high schools, already challenging themselves with Advanced Placement courses. “The rest — they are interested in doing something different,” she said. When these 110 juniors and seniors graduate from high school, most will receive an associate degree from Everett Community College along with their high-school diploma, and many will need just two more years at a college or university to earn a bachelor’s degree. They will have saved tens of thousands of dollars on college costs. And with a college transcript to prove they can handle academic rigor, almost all students get into competitive colleges. Last year’s 47 ORCA graduates netted $400,000 in college scholarships. They got into the University of Washington, Washington State University, Western Washington University, Bard College, Hamilton College, Brigham Young University, the University of Southern California — just to name a few. Kveven says one of the secrets to ORCA’s success is simple. “The best learning happens when somebody who is not your parent sees values in your ideas, and invests time and energy in you,” she said. On board the 34-foot Phocoena — custom-made to be a floating classroom — Kveven’s strong, nasally voice carried above the noise of the boat’s motors. 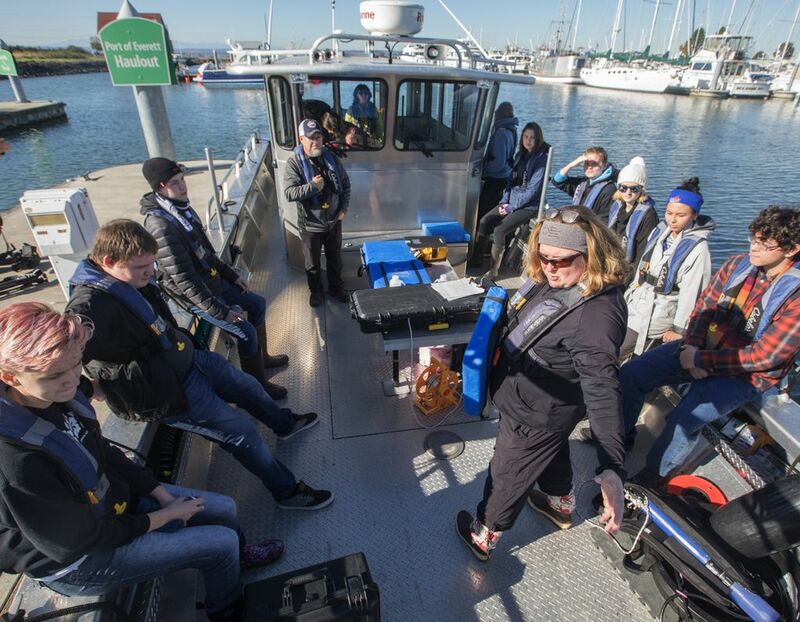 With her boots planted firmly on the rocking deck, she and two other faculty members orchestrated the students’ use of expensive, professional scientific survey equipment. She kept an eye out for wildlife as the boat cut through the water. “Oh — western grebe, western grebe! Did you see it?” she shouted. Boat captain Ray Brown cut the engine, and the students craned their necks to spot the bird, which plunged underwater. Kveven described how the grebe, a diving bird that feeds on fish, helps biologists gather clues about the state of the fishery. Abby Viebrock, of Woodinville, and Dayanara Heaton, of Arlington, assigned to watch for birds and mammals, riffled through a guidebook to identify nine birds bobbing on the surface, with distinctive orange bills and black feathers. After discarding several possibilities, Viebrock pointed to a likely photo in her guidebook. “I think it’s a surf scoter,” she told Kveven. Viebrock takes the bus every day to Everett from Woodinville, where she would have been entering her junior year at Woodinville High. She was a little worried at first about leaving her friends behind. But she likes the dynamic of a school with fewer than 100 students, the strong relationships she’s building with teachers, and the way the subjects she’s studying all connect. The school is on the second floor of a waterfront building, next door to a marine-supply store and just north of Naval Station Everett. Like the boat, it’s outfitted with professional-grade science-lab equipment. When the cruise is over, students will return to their labs to count and categorize their finds. They’ll use algebra to estimate the abundance and diversity of various types of plankton, plot data on water temperature and salinity, and record counts of the birds and animals spotted on the two-hour trip. Unlike a typical high school, there are no electives at ORCA the first year. The school is on the quarter system, like a community college, and for fall quarter every junior took precalculus, American history, a humanities class that explores how people view nature, and a class called ocean technology, with lessons on how to use oceanography tools and manage data. 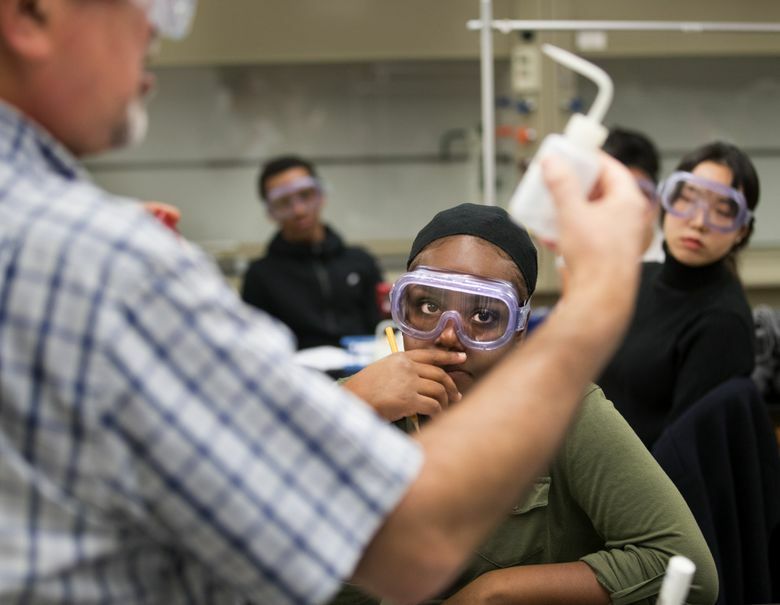 When they become seniors, they’ll have a choice of electives when they take some classes on the Everett Community College campus, and they’ll do an independent research project. “It’s everything I’d expected it to be, and more,” said Emily Conradt, who came from Monroe High School. She’d heard about the program in seventh grade, and “my heart was absolutely set on going.” Conradt hopes to major in marine biology at the University of California, San Diego. Almost all the money to run ORCA comes from Running Start, the 25-year-old state program that allows high-school students to take an unlimited number of community-college classes for free. About 10 percent of students at ORCA qualify for free or reduced-price lunch, compared to the statewide total of 43 percent. ORCA tries to help students without cars by working with Everett Transit to provide bus service to a nearby stop at times that mirror the school’s start and end times. And the school provides what it calls micro-scholarships for textbooks, a summer research course and field trips. Since it was founded in 2004 with early help from a grant from the Bill & Melinda Gates Foundation, 425 students have graduated from ORCA, and 95 percent of them have gone on to a four-year university. Two-thirds have majored in a STEM field (science, technology, engineering and math). In an email from Somalia, where she works now, ORCA grad Anna Russell said she was bored and restless at Lakewood High School in Marysville before she transferred to ORCA. Russell studied the health and diet of river otters, which she was able to connect to her interest in public health. And when she went on to the University of Washington, she found classes there easy by comparison. Brijonnay Madrigal, a Mariner High student, was able to keep one foot in the door at her high school, where she was student-body president her senior year. At the same time, she attended ORCA and created her own research project on harbor-seal identification. Madrigal graduated from ORCA in 2012, and then double-majored in marine biology and communications at the University of Hawai’i at Manoa. She’s now working on a master’s at Moss Landing Marine Labs, a multicampus marine-research consortium of the California State University System. For her graduate thesis, she’s conducting research on Risso’s dolphins in Monterey Bay. In her first quarter at the UW, ORCA graduate Alexis Dittoe — just 18 at the time — had already completed all of her general education requirements and was able to take higher-level courses immediately. She and a fellow ORCA grad had no trouble holding their own, and even excelling, in a class on the marine environment with upperclassmen and graduate students. Dittoe is now in her first year at the UW’s nursing school. Kveven believes ORCA could be a model for other schools like it, schools that organize themselves around a theme like marine biology, and offer rigorous classes that allow students to earn high school and college credit at the same time. But although she’s pitched the idea over and over again, to educators from coast to coast, no one has taken up her challenge. There is still only one ORCA, and she’s not sure why. In Washington, the program most similar to ORCA is Raisbeck Aviation High School in Burien, which is organized around the study of aviation — although it covers grades 9-12, and doesn’t offer dual-credit classes. ORCA has another, secret benefit: Over its 13 years, it has built up a wellspring of data about the health of Possession Sound. From zooplankton to humpback whales, ORCA is contributing meaningful scientific observations and analyses to the understanding of an important ecosystem.